WHAT IS A PEA APHID? 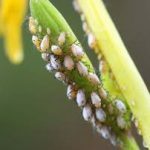 What are aphids? How many of us know the answer? Pea aphid, otherwise known as green dolphin, pea louse, and clover louse is scientifically called Acyrthosiphon pisum. It is a sap-sucking insect belonging to the Aphididae family. APHIDS HAVE SOFT BODY, SMALL EYES, LARGE ANTENNAS AND MOUTH DESIGNED FOR SUCKING. This species feeds on different varieties of legumes worldwide, including forage crops. They are also ranked among the aphid species which are of major agronomical importance. The pea aphid is one of the model organisms used for biological study who has its genome sequenced and annotated. You can see that this aphid is globally distributed all over temperate regions. 🔬 Adult – Pea aphids are small sized and are colored green or pink. These are soft-bodied insects look similar to the blue alfalfa aphid; however the pea aphids have their antennae banded at the segments. Their main feed is a wide range of crop plants, including alfalfa, beans as well as artichoke during the spring and fall. Pea aphids inject toxin into the plant tissues that slows growth and can cause reduction in yields. Many infested plants may not survive from this attack. The pea aphid adult is long-legged and colored light to deep green. It has reddish eyes and a body length of 2.0 to 4.0 mm. In North Carolina, most adult peas aphids are wingless. The cornicles (a pair of tailpipe-like structures projecting from the abdomen) of this species are characteristically long & slender. 🔬 Egg – If you notice carefully, you can see that the egg of a pea aphid is approximately 0.85 mm long.The light green egg turns to a shiny black shade before it hatches. These Eggs are very rare in North Carolina. 🔬 Nymph – Compared to larger wingless adults, immature aphids are smaller. It requires four molts for reaching the adult stage. During autumn, the female pea aphids lay fertilized eggs overwinter that are ready to hatch by the following spring. The nymphs emerging from these eggs are all females, who undergo four moults and then reach and give birth. The wingless, female pea aphids continue the process of feeding and breeding all throughout the winter. During spring, feeding activity increases. It is at this time; some of the winged aphids develop and migrate, usually to peas. Most of the progeny of the winged females develop into a set of wingless females. 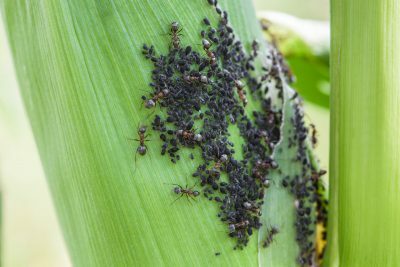 You can see that whenever overcrowding occurs, the number of winged aphids increases and they migrate to different areas to establish new colonies. Each adult female produces 6 to 8 nymphs on a daily basis, until she has about 100 offsprings. These nymphs mature into adults within 10 to 14 days. It is difficult to find out the number of generations since generations overlap and reproduction continues all year. The pea aphid survives best and reproduces most rapidly at temperatures around 65 degrees F with humidities near 80 percent. 🔬 Host Plants – Pea aphid feeds on many species of among 13 plant families including over 200 species of Fabaceae. It has a moderate host range. This species is represented by a number of races and subspecies In Europe and Asia. Pea aphids infest the garden crops like field peas, sweet clover, alfalfa. sweet peas , and some leguminous weeds. The important overwintering hosts include Vetch and crimson clover. 🔬 Distribution – The pea aphid is found throughout the United States and Canada in regions where peas and alfalfa are grown. 🔬 Damage caused – Pea aphids extract the sap from terminal leaves and stem of the host plant. This can result in deformation, wilting, and even death of the host depending upon the level of infestation .Plants that do survive heavy infestations turn out to be short and bunched with more lightly colored tops compared to healthy plants. Wilted plants appear like brownish spots in the field. Moreover, these plants are coated with shiny honeydew secreted by the pea aphids. They cast skins which may give leaves and ground a whitish appearance. These aphids have also been known to transmit the pea enation mosaic and yellow bean mosaic viruses. The pea enation mosaic, has been a major problem in New York but has not been reported in North Carolina. Pea aphid promotes amino acid metabolism both in Medicago truncatula and bacteriocytes to favor aphid population growth under elevated CO2. Pea aphid are unique in that they can synthesize energy themselves .They might be one of the only animals to turn sunlight into energy like a plant. 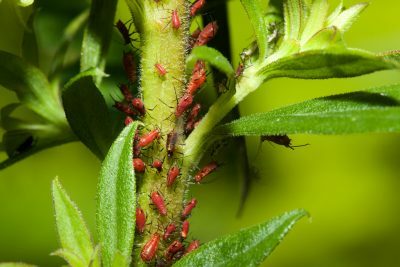 Aphids are able to produce their own carotenoids, which are pigments usually produced by plants, fungi and microorganisms. Aphids obtained this pigment-producing power as a result of swapping genes with fungi. 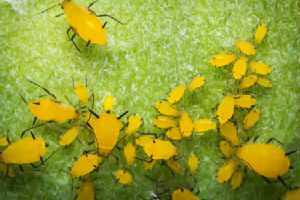 The carotenoids might be the reason behind the aphid’s apparent photosynthesis-like abilities. Another interesting aspect is that these Carotenoids contribute to pea aphids’ body color.The color varies depending on environmental conditions. Aphids produced high levels of carotenoids in the cold and were green, while during optimal conditions, they were seen as orange aphids with intermediate levels of carotenoids, and white aphids with almost no pigment appeared in large populations which were faced with limited resources. You would be interested to know that Scientists found that these aphids have the ability to survive on sunlight, by converting it into energy like plants do and thus eliminating the need for food. When researchers measured the ATP levels in the 3 groups of aphids, they found that green ones made considerably more ATP than the white aphids. The orange aphids produced more ATP mostly when exposed to sunlight than when moved into dark areas. Depending on the weather, Aphids develop from birth and attain maturity in 5 to 50 days. The optimum temperatures required for rapid development of pea aphids is about 23 – 28ºC. Did you know that all pea aphids are female throughout spring and summer? The summer female can produce around 50-150 young during her lifetime. If the host crop they occupy is cut during spring or summer, the winged female aphids leave to search for new plants to survive. In late September or October, winged males as well as wingless females are produced. These mate and the wingless females lay eggs on leaves and stems. There may be seven to 15 generations per year. Population densities are at their highest in early summer, then decrease as a result of predation and parasitism. You will find that several morphs exist in pea aphids. Besides the differences between sexual and parthenogenetic morphs, there are also winged and wingless morphs. Overcrowding and poor food quality will trigger the development of winged individuals in the subsequent generations. These Winged aphids can then colonize other host plants. Pea aphids also show hereditary body color variations of green or red/pink. The green morphs are generally more frequent in natural populations. Pea Aphids hosts the bacteria called Buchnera aphidicola. This provides essential amino acids which is necessary for aphid reproduction. Buchnera is transmitted from the mothers to offspring, and it has coevolved with aphids for many years.This co existence affects ecologically important traits such as body color, nutrition, resistance to abiotic and biotic stress. The aphid alarm pheromone (E)-β-farnesene (EBF) is one of the best defence communication mechanisms amongst the insect world. This alarm pheromone is released when any of the aphids are attacked by predators. It induces behavioral reactions in the aphids such as walking or dropping off the host plant. If you refer Kunert et al. (2005), you can read that as a result of the exposure to the alarm pheromone, aphids are able to give birth to winged dispersal morphs that would leave their host plants. They have suggested that the alarm pheromone paves way for a “pseudo crowding” effect .This triggers that alarm pheromone and causes increased walking behavior in aphids. As you research further, you will be able to see many studies on pea aphids have helped to establish that the environmental and genetic components control the production of sexual and winged morphs. Overcrowding and poor food quality will trigger the development of more winged aphids in the subsequent generations. These Winged aphids can then colonize other host plants. Now let’s look at the horror part. 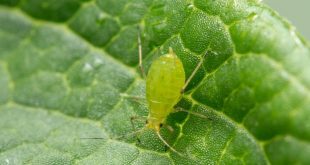 Although the pea aphids appear to be perfectly suited to a vegetarian lifestyle, they don’t restrict their diet to eating plants. While on a study in this topic, Leather makes a startling discovery-“Many years ago I was working on a pea aphid culture and suddenly felt a stinging sensation,” says Leather. When he observed carefully, he realized that it was one of the insects that was probing his wrist. his hands smelled of pea plant. However several decades later, when a student told him that pea aphids in their lab were eating each other, they decided to find more .It was observed that Young aphids climbed onto the backs of adults, probed them with their mouthparts and then sucked blood out of them. THE LONGEST INCIDENCES OF CANNIBALISM ARE CARRIED OUT BY JUVENILES AND TARGETED AT ADULTS. 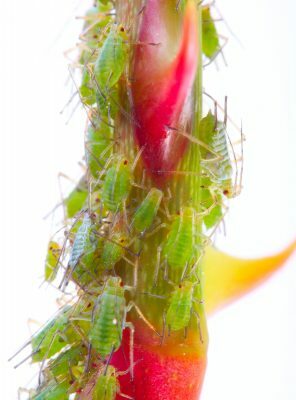 To find out more about this behavior of aphids, Leather and his colleagues placed a mother and two of her offspring – onto a broad bean plant (Vicia faba) leaves. Then they added a fourth, unrelated aphid, and observed their behaviour. Cannibalism was found to be common, and juveniles did it far more often than the adults as a strategy to cope with food shortages. To experiment more, the team placed the insects on plants that were damaged by giving them less water. The Aphids on the more desiccated plants resorted more to cannibalism than aphids on well-watered plants. This suggests that cannibalism was indeed a response to lack of food. “In times of stress, this is a sort of survival mechanism,” says Leather. The young aphids were also choosy about who they attacked. They chose unrelated insects more. Unrelated aphids are competitors and so it might have seemed advantageous to attack them regardless of the food situation. 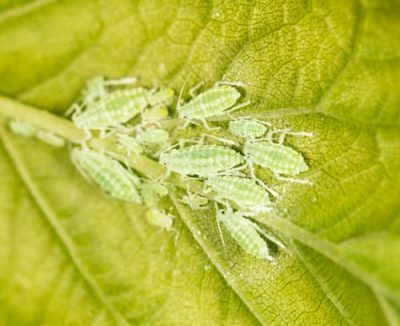 This behavior suggests that pea aphids can tell the difference between their own clones and unrelated insects, which nobody thought they could do. Ready for another weird twist? Despite being more likely to target unrelated aphids, there have been actual episodes of blood sucking that lasted longer when the insect feasted on one of its clones. It may be a fact that clones may be willing to let their fellows eat them to ensure that at least some of the clones would survive to reproduce and pass on their shared genes. Unrelated aphids, by contrast, would probably resist being eaten. This also helps explain why it is the young that prey on adults. “It’s more important for the juveniles to survive,” says Leather, so the adults may be prepared to sacrifice themselves. Protection against pea aphids includes the use of natural predators and parasitoids chemical insecticides, and the selection of resistant cultivars. When the aphids infest, exposing them to direct sunlight will also reduce the aphid population. Proper and effective crop management helps to resist aphid attack to a large extent. Predators and parasites usually control this pest, to some extent, and resistant varieties are available. A series of economic threshold based on the height of the plant and the number of aphids per stem are also helpful to determine when chemical control becomes necessary. 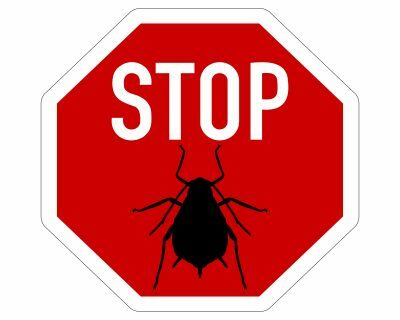 They are as follows: 40 to 50 aphids per 25 cm (10 inch) or shorter stem; 70 to 80 aphids per 25 to 38 cm (10 to 15 inch) stem; 100 aphids per 50 cm (20 inch) stem. If this economic threshold is exceeded, a single application of insecticide when 50% of plants have produced some young pods protects the crop against yield loss and is cost-effective. Control at the early pod stage provides protection through the pod formation and elongation stages, which are very sensitive to aphid damage. You can resort to Sampling to determine aphid density when 50 to 75% of the pea plants are in flower. Just take 20 sweeps in each of 5 locations throughout the field and then estimate the volume of aphids in the net after each set of sweeps.